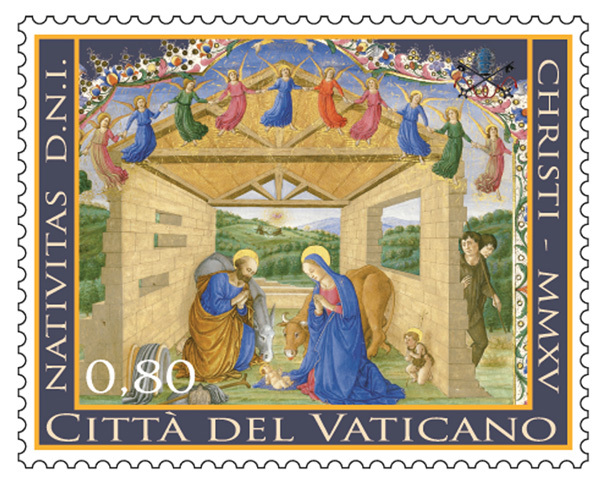 VATICAN CITY (CNS) – This year’s Vatican Christmas stamps feature a 15th-century manuscript illumination of the Holy Family. Flanked by a lowing ox and a donkey, Mary and Joseph pray over Baby Jesus as angels sing above and poor shepherds approach. The image, painted by an unknown artist, is from the Codices Urbinates Latini 239 (1477-1478) from the Vatican Library. The special edition stamps went on sale Nov. 19 in two denominations of 80 euro cents and 95 euro cents in sheets of 10. The Vatican post office and Philatelic and Numismatic Office also offer a collector’s booklet containing four 95 euro-cent stamps and commemorative cover for 3.80 euro. All order requests should be made by email to: order.ufn@scv.va. The Vatican stamp office will then send a proper order form and methods of payment. Please sent order form for This Year’s Vatican Christmas Stamp. Please send me via email the Order Form on ordering This Year’s Vatican Christmas Stamp featuring a 15th century manuscript illumination of the Holy Family. Please include Price List. Thank You!